A couple weekends ago we were very busy with projects and experiments. One of our experiments was quick to set up but s.l.o.w. to deliver. Miss M had read about making your own salt crystals somewhere so we had to give it a try, too. Naturally. She mixed one cup of tap water and about three tablespoons of table salt vigorously. 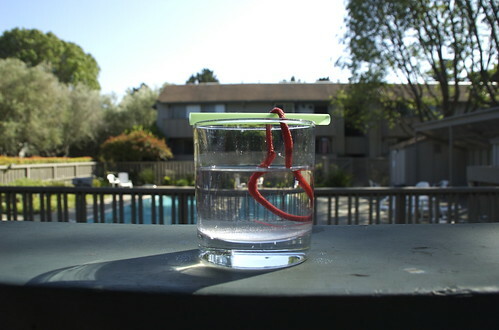 Set a looped string to hang off of a straw on top of our cup, and left it out on the balcony to do it’s magic. 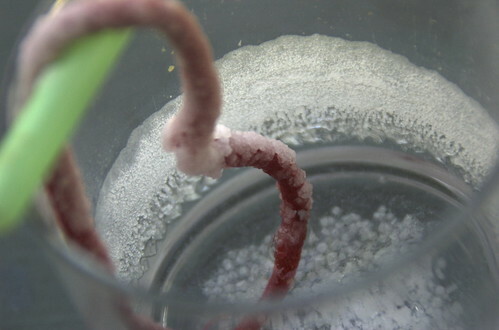 We fully expected salt crystals to form along the string over-night. We waited, and waited, checking our cup every morning for a week. Our water was clearly evaporating, but nothing else. It really looked like our experiment was going to be a dud. It happens sometimes. Finally, we stopped checking on it. A few days later, I went to get the cup to toss it in the washer. It had crystals! Rock-hard pebbles had formed on the bottom of our cup! The stuff that had formed on the string was kind-of icky, but the crystals were beautiful. "And salty, Mom!" said my girl following her taste-test. We ended up with about a tablespoon of salt that now sits in a small white bowl by the stove. I’d like to think that I will use it for cooking, but… we live right next to a high-way and I’d hate to think of all the car-pollution that’s probably been sucked in there.